Earlier this month, I decided to do something for me. I didn’t treat myself to a nice meal, bottle of wine or a pair of new boots. Instead, I treated myself to a cleaner body — on the inside. Joining my mom and a trio of friends, I participated in the 10-Day Green Smoothie Cleanse. As someone who is very disciplined (and a former vegetarian), I thought, “10 days? Piece of cake!” Here are 10 lessons I learned from my cleanse that will hopefully help you breeze through your cleanse. There is strength in numbers. – Why do a cleanse alone when you can share the wealth (or misery) of clean insides together with your family and friends? This was a no-brainer for me. I joined a trio of friends, two of whom happen to be vets, and my mom (a newbie to this cleanse) in the cleanse and the support we gave each other was priceless. Yes, I contemplated quitting, particularly on Day 3 (more on that later), but knowing that my sisters and mom were cleansing too made me feel like we were on a team and I had to do my part to make sure we didn’t lose the game. Planning, planning, planning. – Planning is the foundation for a successful cleanse — especially if you are a parent, work in an office away from home or are just super busy and always on the go. Do go grocery shopping for all of your smoothie ingredients, snacks and detox tea. Grocery store runs during the cleanse will be torture. Like for real. Don’t even try it. If you have to, send someone to do it for you. You’ll be glad you stayed strong and you will see even better results. Consider your investment – I am someone who goes hard about nearly everything, which admittedly can be a flaw. (I’m working on it.) But the point is, for this cleanse or any goal you’ve set for the new year, you will get out what you put in. I know that’s cliche, but it is so true. Commit to transforming your diet, eliminated sugar sweetened beverages and fatty foods and you will improve your results and multiply the impact of your 10-day commitment. But even if you decide to go back to your old habits after the cleanse, follow the recipes in the book. This is not the time to remix things like a 1999 Bad Boys track. The book is a New York Times Bestseller for a reason. Trust Ms. Smith enough to not alter her recipes. Superfood snacking. – I admit that I did not buy the book before starting the cleanse. (And the library still hasn’t retrieved it for me. Smh.) Shame on me, I know. But because two of my friends are cleanse vets, I learned on Day 4 that Mom and I could snack. It was like winning the cleanse Powerball. I asked my brother to get us carrots, celery and cucumbers. Every bite tasted like I was in the Garden of Eden. And don’t get me started on the hardboiled eggs! I literally ate at least 36 eggs in the last three days. It was like eating steak. Get social. – In addition to my group of friends who were in the struggle with me, I looked up the support group on Facebook. It was a truly motivating move. I saw photos of approved snacks, read stories of weight loss and gasped at the before and after photos. I even shared which day I was on with the group. It’s fascinating doing the same thing across distance, time zones, cultures and beliefs can unite people who would normally never engage socially on Facebook. So do yourself a favor and join the Facebook group. Keep pushing. – There will be one day that you will seriously consider giving up. Day 3 was the most challenging day for me during my cleanse. I was hangry, tired from traveling and I just had a sour attitude. In my mind, the cleanse was stupid. It wasn’t going to work and why was I doing this anyway? On the road to achieving any goal, there’s always opposition from without and from within. I was training my body to function on healthy foods, water and tea in order to break bad habits and kick myself out of a state of laziness. But I had conditioned my body not to give up the things it thought it needed without a fight. You will have a day or maybe even a pair of days like this. But don’t fall for them. Your body is an amazing machine. Power through even though you feel like giving up. Get the book. – I feel really bad I didn’t buy or borrow the book before starting the cleanse. However, I’m proud that I didn’t let not having it prevent me from successfully completing it. (Perspective.) I know that things were a little crazy for me at the beginning of the year, so I don’t beat myself up for that. I’m really glad my friends were able to coach me and answer all the questions I had. Modify, if necessary. – We’ve already talked about my disciplined nature so typically, I’m not about that modification life. Seriously. But because I did travel home to Chicago while on the cleanse, I decided to modify it so I could be social and hang out with friends who I don’t usually see. Modification is explained in the book and I will just add that you should be smart and don’t waste your time and effort getting carried away. I decided on water, a dressingless spinach salad with apples, grapes, cucumbers, tomatoes and a side of carrots and celery. I quickly learned I wasn’t as hungry as I thought I was. I didn’t even eat half of the salad even though my body seemed to be telling me it was hungry. That also helped my re-learn the lesson that if I am no longer hungry, I should stop eating. What a concept! Record your progress. – If nothing happens to you while you’re on the 10-day Green Smoothie Cleanse you ain’t doing it right. (Re-visit #3.) For real. Take naked full-body selfies, weigh yourself, keep a food journal and enjoy the journey of losing weight, expelling the toxins from within and sleeping like a baby. Do it again. – One of the best things about doing this cleanse was reminding myself that my mind is stronger than my flesh. And therefore, I should lead my body with my mind. With that being said, I’ve marked my calendar to do one cleanse each quarter for maintenance. I’m trying to drink more water, detox tea, make smarter, healthier food choices and take the time to care for myself more and more. Hopefully, each cleanse will give me new revelations about my body, my diet and my emotions. Have you done the 10-Day Green Smoothie Cleanse? What was your journey like? Courtney Mayberry is a savvy writer with a keen trend-spotting ability and confidence to produce and edit content across multiple platforms. 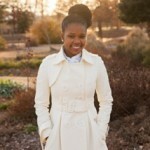 She is passionate about natural hair and beauty tips, (re)defining motherhood as a Millennial and tech. Courtney enjoys working out, cooking while listening to music and spending time with her family.